Today was an exercise of tactical withdrawal, some days the weather is not just going to be on your side and all you can do is get out of its way. With rains forecast to move east over the range and down to the coast, we were forced away from the more interesting roads but the main road home still proved to be a lot of fun. We awoke to heavy skies and drops of rain, nothing serious yet but enough to consider carefully our plan for today. We’d had an amazing three days enjoying the roads of southern New South Wales so decided that we would stay on the coast on the Princes Highway and get home quickly. Preparing for rain, the muffs were on and Gary donned his waterproof trousers; my gear is much more rain resistant so I decided to chance it. 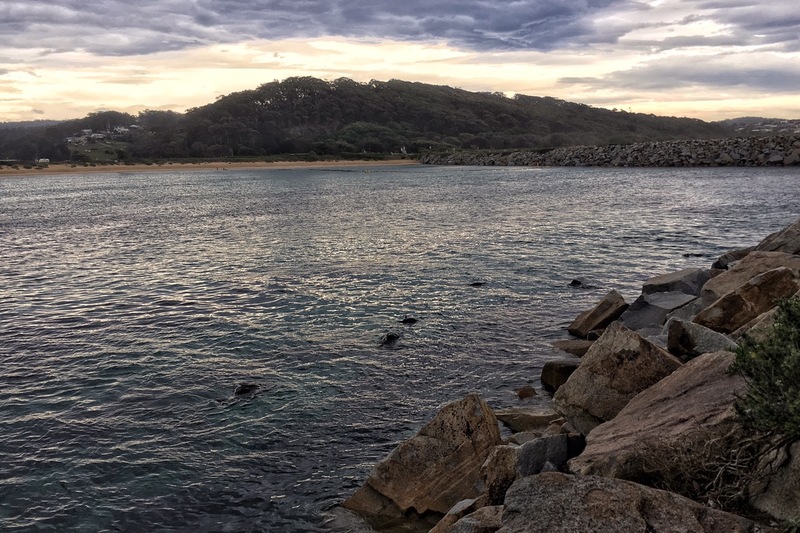 We pootled around Narooma, checking out the cliff top golf course and the view beyond (quite breathtaking) before riding to the end of one of the harbour walls and checking out the seals again. As you can see, they seemed perfectly happy with their lot. We then rode out of Narooma, across its beautiful old bridge (1931) and north towards Batemans Bay. After Batemans Bay, we travelled through Ulladulla where we were stopped briefly for an Anzac Day parade. Even though this road is a major highway, its well maintained surface, single lanes and wonderful curves provide much fun for the motorbike rider. It also has many overtaking opportunities with specific lanes and clear, long stretches to ensure that the keen rider does not become stuck behind a truck, or a caravan, or a car pulling a boat, or a Camry, etc etc, for too long. As we rode, looking to our left west at the Range, we could see the skies becoming heavy and the rain falling on the fun twisty roads which are otherwise beautiful in dry weather. This was pretty much our journey home; we arrived home early afternoon, around 10 minutes before the heavens opened and the rain came down! We felt vindicated that we had not forgone some amazing riding on an unfounded desire to stay dry.